Interesting review. I haven’t yet got a hold of this, but look forward to reading it. I’m a little bummed to find out we get no Year-in-Review summaries, as I distinctly enjoy them. 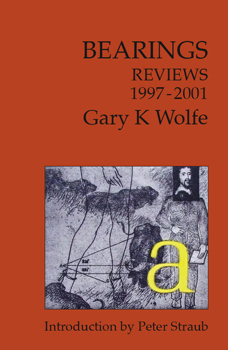 Your review of Wolfe’s book does occasionally create the impression of a cat toying with its food, but mostly your critical distance from the text under discussion is to be admired. As long as you didn’t feel teased. Out of hundreds of reviews by Wolfe over the last few years, one of my favorite moments has to be in his discussion of a certain fantasy book, where he provided some sort of candid acknowledgement that he may be the wrong type of reader for straight/epic fantasy. Don’t have the issue in front of me, but he illustrated the point by relating the sense of being in the midst of an action sequence and hoping that if he went to get a sandwich and came back, the non-action part of the story would have resumed. I remember that! I can’t remember what book it was either, though. I didn’t do Wolfe justice. One of the things I’ve realized I enjoy in Wolfe’s reviews — part of the distance from the text you identify — is the humor, the sardonic detachment at times from the Seriousness of Reading and Reviewing.